Insurance is not just a “set it and forget it” coverage. There are many circumstances that could cause you to review your insurance policies. Circumstances change and when they do, you do not want to be left under insured or paying for insurance you no longer need. 1. 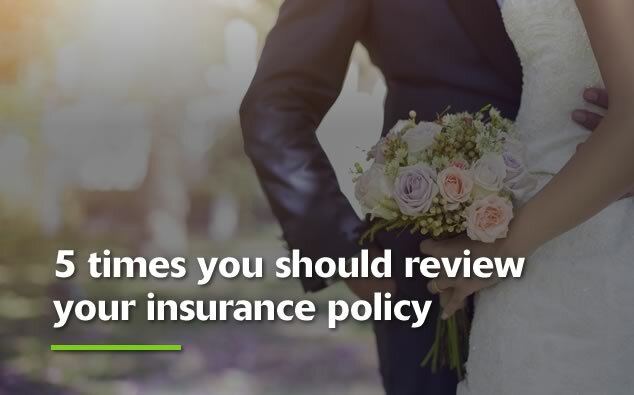 Major life events – Getting married, having or adopting a child, or purchasing a new home are a few examples of life events that may cause you to review your insurance plans but there are many other examples that might not be quite as obvious. Grown children leaving home for college (or moving back in after being away) or elderly parents moving into your home for extra care can impact your insurance policies. Other life events may include the addition of teen drivers, divorce, or death of a spouse. 2. Home remodels – Finishing a basement or converting a garage into living space could impact your insurance policies. In addition, common remodeling projects like kitchen or bathroom upgrades could cause your home to be under insured if you experience a total loss. 3. Other home updates – Your new heating and cooling system might not be visible to guests but your insurance company should probably know about it. In addition, updates to home security systems, plumbing, and electrical work should all trigger a call to your insurer. 4. Personal Property – If you’ve recently upgraded your home furnishings, you may wish to look at your personal property coverage. As time goes on, we tend to accumulate more (or more expensive) belongings. Make sure that your policy reflects the replacement costs associated with your prized possessions. Do I need additional coverage for flood, earthquake, hurricane, or umbrella coverage? Does it make sense to increase my deductible to save on premium? Has the company made changes in coverage? November 30, 2017 in Home Insurance, Insurance, Personal.